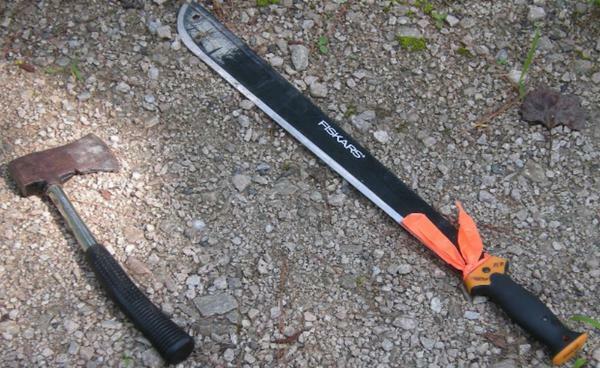 Accomplishing forest stewardship requires many tools. Hand-applied herbicides are effective tools that selectively control vegetation in a variety of circumstances. This guide reviews the most efficient and cost effective methods and formulations to conduct forest resource management on your land. Hand-applied herbicides fit the bill where convenience, environmental concern, lack of timber markets, or smoke restrictions prohibit the landowner from using more traditional methods of vegetation control. Hand-applied herbicide methods are simple, safe, and inexpensive. They allow landowners to practice timber, wildlife, and recreation management with a minimum investment in equipment. A number of herbicides are labeled for individual stem treatment. Many are listed in Table 1. Consult with your county Extension agent, state forest service forester, forestry consultant, or weed control specialist for assistance with selecting the herbicide, formulation, and application technique suitable to achieve a specific objective. Table 1. Herbicides labeled for individual stem treatments. Note: These recommendations are not intended for growers of Christmas trees and woody ornamentals. Those growers should refer to material specifically suited to their purposes. The following chart lists the advantages and disadvantages of individual stem and application techniques. Basal Stem (Bark) Treatment. Herbicide solution is applied to the outer bark at or near the ground line. This method includes full basal and streamline (thinline) basal. Cut Surface. Herbicide solution is applied to a fresh-cut stump or to a cut surface on a standing stem. This method includes tree injection, hack and squirt, frill and spray, and fresh-cut stump treatment. Soil Spot Treatment. Herbicide solution is applied to the top of the soil in a regular grid pattern of spots or around target stems. Directed Foliar. Herbicide is sprayed on the foliage of unwanted brush with care taken to avoid application to desirable stems. For basal bark and directed foliar techniques, a backpack sprayer with a diaphragm pump is preferred. Piston pumps are also used, but diaphragm pump units operate at lower pressures and are less prone to leak (Figure 1). Normal pumping of a diaphragm unit maintains the 20 to 40 psi (pounds per square inch) pressure recommended for hand applications. Specific recommendations for nozzle sizes and specialized nozzles will be discussed as they apply to an application method. 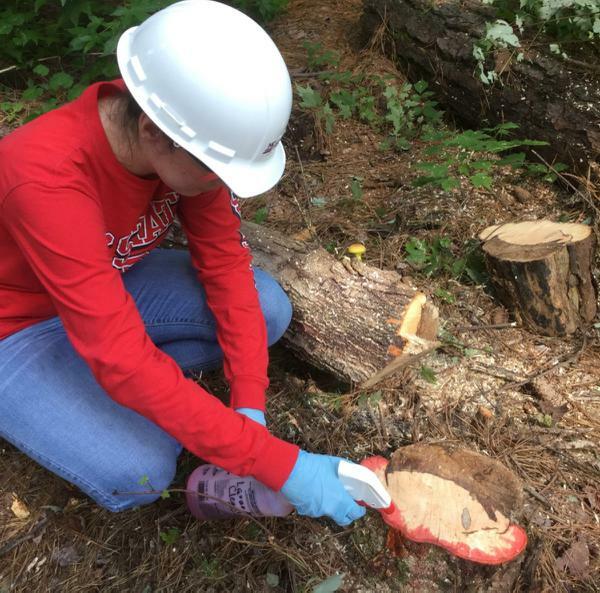 For the cut surface application method, a simple spray bottle should suffice if treating a small number of freshly cut stumps or for delivering herbicide to hacks made with a hatchet or machete (Figure 2 and Figure 3). 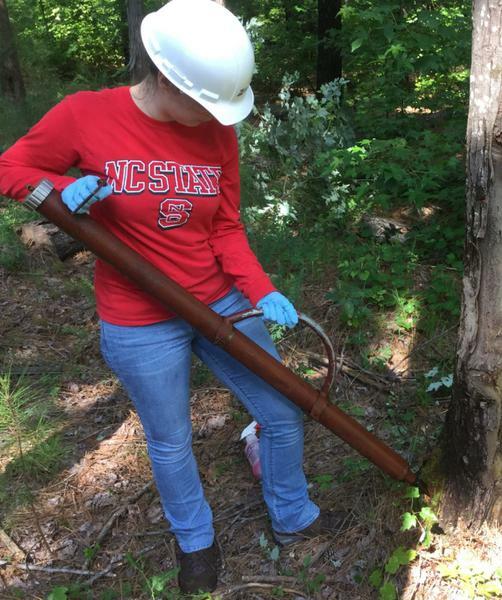 At a higher level of cost, tree injectors, such as a hypo-hatchet, may be purchased. These tools wound the stem and deliver a measured dose of herbicide. Figure 1. Common backpack pumps: piston (left) and diaphragm (right). Piston and diaphragm mechanisms can be seen at the bottom of each respective pump unit. Photo Courtesy Forestry Suppliers, Inc. Used by permission. 580111. Figure 2. Hatchet and machete used for cut surface (hack and squirt) method. Figure 3. Hand sprayers used for stump treatment or hack and squirt methods. Full Basal. Apply herbicide to the lower 12 to 20 inches of the stem (Figure 4). Full basal works best on stems 6 inches or less in diameter and requires that the stem be completely wet with herbicide solution on all sides. A narrow angle, flat-fan spray nozzle or adjustable spray tip works well. Full basal treatments are usually done during the dormant season although some herbicides work equally well when leaves are present. Thinline basal. This is most effective on juvenile, thin-barked stems up to 2 inches in diameter. A 2- to 3-inch band of spray is applied to one side of the stem from 6 to 24 inches above ground level (Figure 5). Correctly done, the herbicide solution will encircle the stem at the point of impact and run down the stem 6 to 10 inches, which increases the surface area for absorption. While a narrow (1- to 2-mm) flat spray adjusted vertically may be used, a 1- to 2-mm jet stream nozzle provides better accuracy and less waste. The best combination is a diaphragm backpack pump equipped with a specialized "gunjet" (Figure 6). Gunjets are more costly but have advantages: (1) they provide better directional accuracy, (2) they can meter out precise levels of herbicide, and (3) they are more convenient in the woods than conventional wands. Gunjets are tipped with a 1-mm (TP0001 or DE-1) disk or a 2-mm (TP0002 or DE-2) tip for more experienced applicators. Figure 4. Full basal application with backpack piston pump and wand with 2-mm (0002) flat spray nozzle with fan set horizontally. Figure 5. Thinline basal treatment using piston backpack pump and wand with a 2-mm (0002) flat spray nozzle with spray fan set vertically. Figure 6. Meterjet Gunjet with metered volume. This will deliver 1.0 to 16.0 ml with one pull of the trigger. Cut surface treatments include fresh cut stump, hack and squirt, frill and spray, and tree injection. As the name implies, each method involves cutting or severing the stem and applying a dose of herbicide or herbicide solution to the cut surface. Cut surface treatments are effective from mid-February through most of the growing season. December through January is generally less effective. Periods of heavy sap flow or prolonged drought have resulted in reduced effectiveness. Some herbicides work better during specific time periods. Labeling of most herbicides gives information on optimum application timing. Fresh-Cut Stump Treatment. Stump treatment is done to retard re-sprouting of severed stems. A backpack sprayer with a wand or gunjet using a straight stream, fan, or hollow cone nozzle is often used. 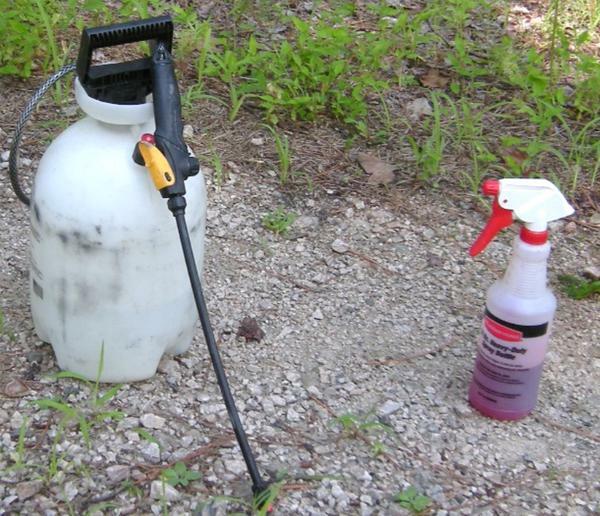 For small numbers of stumps, a utility spray bottle is adequate (Figure 7). For stumps less than 3 inches in diameter, the entire stump is sprayed. On larger stumps, it is most important to thoroughly treat the outer 1-inch layer. For water based herbicides, it is critical to treat as quickly as possible after cutting. Oil based herbicides can be used within a 2-hour window, but have best results if treatment is within 30 minutes after cutting. Stump treatment can be done at any time of year. Hack and Squirt/Frill and Spray. All that is needed to do "hack and squirt" is a hatchet and a spray bottle. Use the hatchet to wound the tree at intervals encircling the stem, then spray each wound with herbicide (Figure 8). The interval between hacks will vary with the herbicide used and the species of tree. Completely encircling the stems with notches is also termed “frill method”. Hacking is done at a convenient height, usually waist high. Commercial spray bottles that deliver measured doses of herbicide (commonly 1 ml per trigger pull) are available. Hack and squirt can be done at any time of year but is practical only on small areas where a small number of stems will be treated. On large jobs, too much time would be wasted refilling the squirt bottle. Tree Injection. 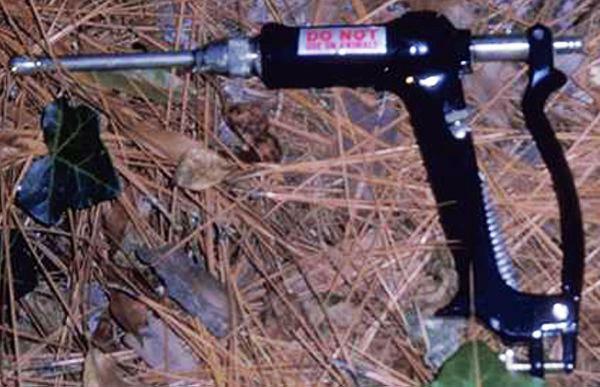 Tree injection is done with a tubular tree injector or hatchet type injector. It is physically demanding since the applicator must repeatedly strike target stems with a sharp tool to inject herbicide. Tubular tree injectors are long hollow tubes armed with a chisel-like blade that must be kept sharp (Figure 9). On older models, the tube serves as a herbicide reservoir. Upon striking the stem, a handle or wire on the injector is pulled to inject a calibrated dose. A calibration cylinder is provided with injectors, and calibration is varied usually via a lock-nut adjustment. New tubular tree injectors include herbicide cartridges that provide a metered volume with each jab. However, as of this publication date, sale of the herbicide cartridges is prohibited in North Carolina. The hatchet-injector is a hatchet with an internal delivery system so that each time the hatchet strikes the stem, a measured dose is injected automatically (Figure 10). This tool is used similarly as the hack and squirt method but delivers the herbicide in one step. Both types of injectors must be frequently sharpened, washed, flushed, and checked for leaks. Injection is best suited for stems larger than 6 inches in diameter. Herbicide labels specify the spacing of injections or injections per diameter inch. Figure 7. Cut stump treatment. 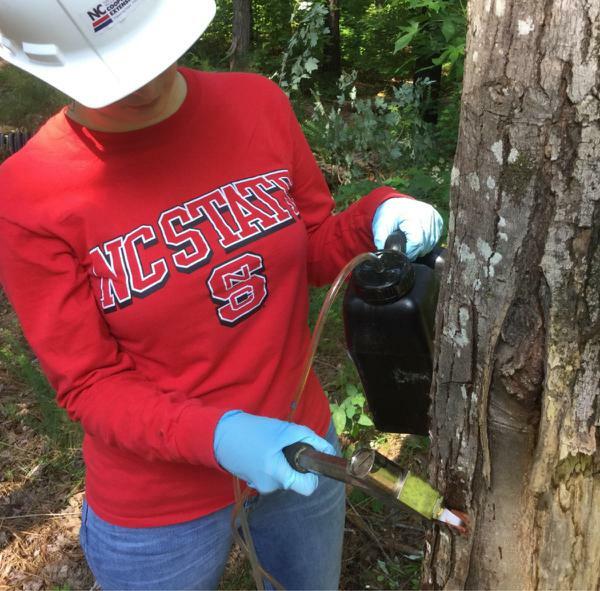 Herbicide only needs to be applied to outer 1-inch (cambium layer) of the stump. Figure 8. Hack and squirt method. Figure 9. Tubular tree injector with herbicide release handle. Figure 10. Hack and squirt method using hypo-hatchet. 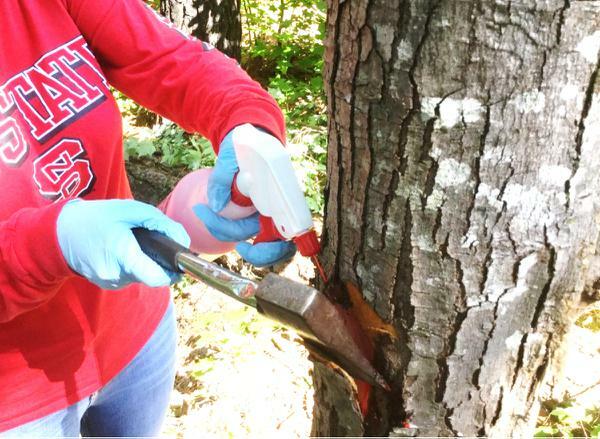 Spot treatment is gaining in popularity for pine release for stands three years old and older. This technique applies liquid or granular hexazinone to the soil in a regular grid pattern across the stand; however, no spots should be within 36 inches of pine stems. The backpack pump equipped with a straight stream nozzle is used. Exercise caution to apply the proper amount based on the vegetation and soil texture conditions. Some form of metered delivery is necessary, such as a spot gun or metered jet gun (Figure 11). Figure 11. 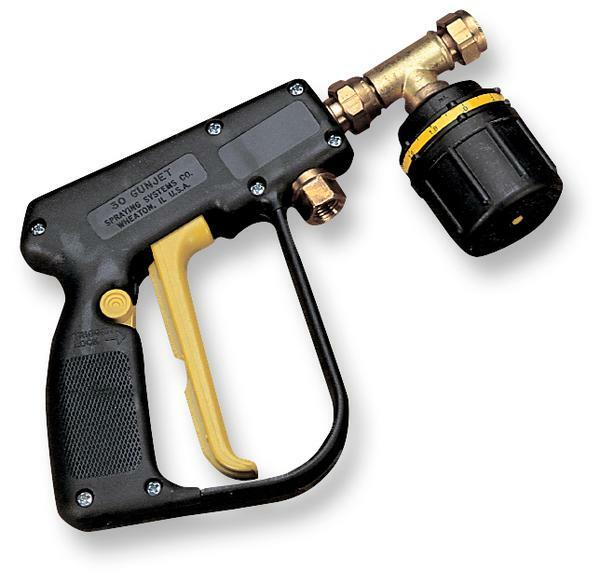 A spot gun for delivering metered volumes of herbicide for soil spot treatment. Directed foliar spraying is an effective growing season treatment as long as care is taken to avoid spraying desirable stems. 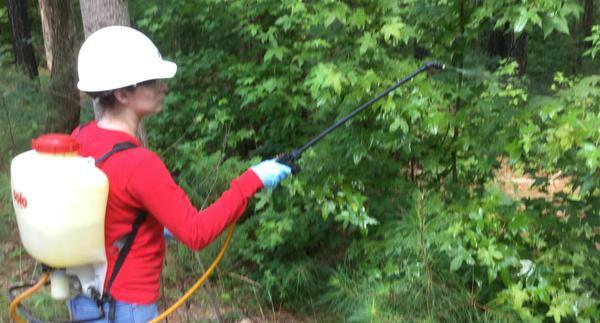 The growing tips and foliage of unwanted stems are sprayed, usually with a backpack sprayer equipped with a spray wand or gunjet (Figure 12). A full cone, flat fan, or adjustable cone spray tip is used. A wand extension is available for brush over 6 feet tall. Recommended spray pressures are 20 to 30 psi. Directed foliar applications are effective after full­leaf in early summer through fall coloration. The herbicide label gives proper mixing instructions and will recommend appropriate wetting agents, penetrants, drift control additives, and dyes. Figure 12. Directed foliar spray using piston backpack pump and spray wand and E0004 nozzle with spray fan set horizonatally. 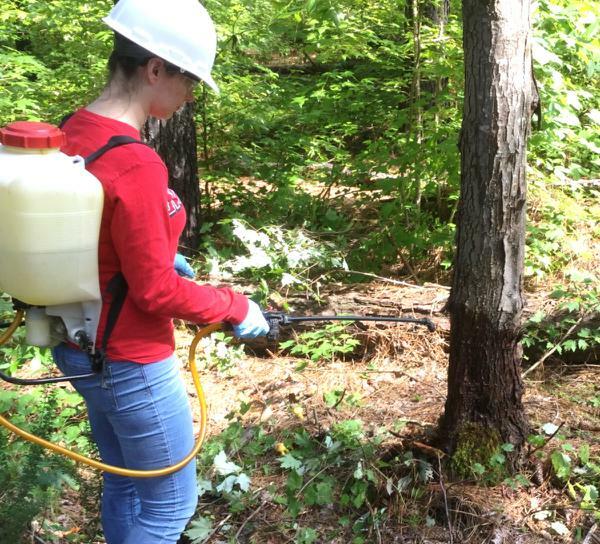 Individual tree herbicide applications offer forest landowners a "hands-on" option to reach forest management objectives. This publication alerts readers to the many herbicides labeled for this use and discusses application technology options. 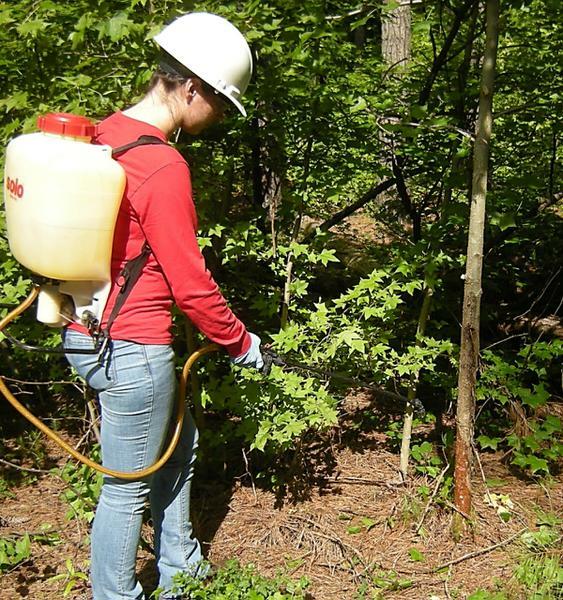 A more detailed listing of species, timing, and application rates are discussed under Chemical Weed Control in Forest Stands in Chapter 7 of the North Carolina Agricultural Chemicals Manual. Landowners should consult a county Extension agent, a state forest service forester, a commercial forester, or a private forestry consultant when deciding which, if any, of the methods and herbicides fit a specific management regime. Remember to always follow label directions carefully. Actual application rates of individual herbicides for each treatment type is well beyond the scope of this publication. However, excellent resources are available that will help you determine which herbicide to use for a given treatment and the appropriate concentrations needed. Table 1 is a reference for matching herbicides with target species and delivery systems based on individual stem treatment. A Quick Guide to Forestry Herbicides Used for Softwood and Hardwood Site Preparation and Release that matches herbicides with conifer and hardwood site preparation and release treatments is available. The Quick Guide provides links to each herbicide label through the Crop Data Management System database of herbicide specimen labels. The labels contain information regarding the safe use, delivery systems, and mixing rates required for each herbicide. The Quick Guide also has a link to a video about interpreting herbicide specimen labels. Another great source of information is the Chemical Weed Control in Forest Stands section of Chapter 7 in the North Carolina Agricultural Chemicals Manual. This section provides a reference of herbicide application type, plants controlled, herbicide active ingredient and mode of action (MOA), amount of formulation per acre and uses, remarks, and precautions. Please note, this guide does not take the place of the specimen label for an herbicide. Always read and follow the specimen label. In broadcast applications, careful calibration of spray equipment is necessary to apply your herbicide at the recommended volumes per acre (see Calibration of a Backpack Pump Sprayer and Mixing Rate Calculations for Broadcast Application). In those cases, recommendations are often given in ounces per acre. For most hand applied herbicide applications, calibration of spray equipment is not required and most labels recommend mixtures based on percent by volume. Table 2 provides commonly used recommendations and gives the amount of herbicide needed to obtain that solution based on the total volume of your mix. Table 2. Herbicide percent by volume. I want to use a 3-gallon backpack sprayer for direct foliar spray using Arsenal AC. The specimen label recommends a 2.5% percent by volume solution. Based on the table above, I would add 9.6 ounces of the herbicide (~10 ounces) to the backpack sprayer and fill it with water up to 3 gallons to achieve the 2.5% by volume. When performing broadcast spraying of herbicides, specimen labels often make recommendations based on ounces per acre. In order to follow the label correctly, two steps need to be followed. First you must calibrate your backpack pump based on the nozzle you intend to use for the application. Next, based on the backpack pump’s spray rate, you need to determine the proper mixing rate to achieve the recommended ounces per acre. STEP 1. Calibrate the backpack pump. Install the nozzle that will provide the desired spray pattern. Fill the spray unit with water, cap it, and use the hand pump to increase the spray pressure. Keep the unit pumped up during the calibration. Wearing the backpack and preferably working over a blacktop surface, hold the gunjet or wand at carrying height—about 2 ½ feet above the ground—and spray a band on the ground. Measure the spray width of the band. From the table below, find the spray width that is closest to your spray width. The column to the right provides the “calibration distances” for each spray width. On the ground, measure the calibration distance associated with your spray width. Then walk this distance at the pace and speed you will be walking when applying the spray. Take a measurement of the time it takes to walk the calibration distance at that pace. Now, spray the water into a container for the same time as measured in step 5 above. Measure the amount of water sprayed into the container in ounces. The ounces measured will equal the spray rate in gallons per acre. Table 3. Spray width and calibration distance. The measured spray is 4.0 feet; the calibration distance is 85 feet. It took 28 seconds to walk the calibration distance. Spraying the nozzle into a container for 28 seconds measured 14 ounces. Therefore, the sprayer is applying 14 gallons per acre when walking at that pace. This example uses the overtop application of 1-year-old loblolly pine to release it from herbaceous weeds using Arsenal AC at 6 fluid ounces per acre. 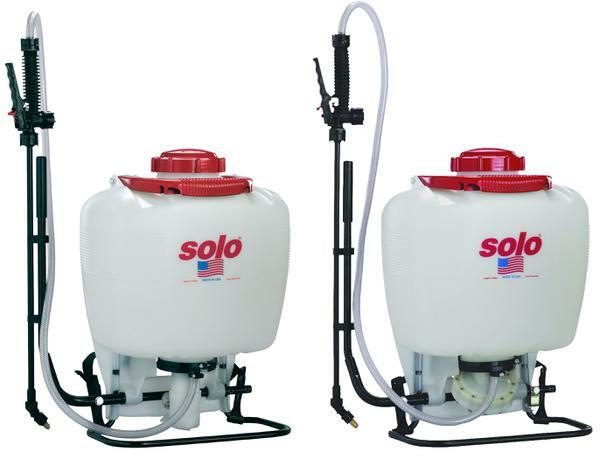 From STEP 1 above, my 3-gallon backpack sprayer has a spray rate of 14 gallons per 1 acre. I want to apply 6 ounces of Arsenal AC per acre, or put another way, I want 6 ounces Arsenal AC in every 14 gallons of total mixture. So to perform the mixture correctly, I add 1.3 ounces Arsenal AC to the backpack pump first, then fill with water to 3 gallons for this treatment. If the recommendation calls for a wetting agent (surfactant), I would run the same calculation using its recommended ounces per acre. This too would be added to the backpack pump prior to filling with water to 3 gallons. You need to include you own equipment’s volume and calibrated spray rate for your mixing rate.